Super rasgadas ou mais ligeiras? | Super torn or lighter? Se quiserem dar destaque apenas às calças então optem por umas super rasgadas combinadas com uma blusa básica e uns saltos. Se por outro lado querem aderir à tendências mas de uma forma mais discreta então optem por umas calças desfiadas mais ligeiras com uma blusa estampada ou um blazer e saltos altos. 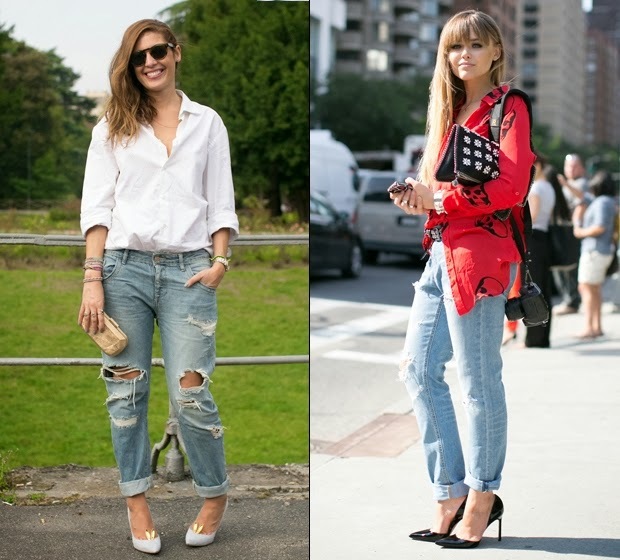 If you want to highlight only the pants then opt for a super ripped combined with a basic blouse and some heels. If on the other hand you want to join the trend but in a more discreet way then opt for a lighter frayed trousers with a patterned blouse or a blazer and high heels. As tendências vão e vêm com as estações e às vezes é complicado investir em todas as tendências. Se tiverem que optar apenas por um estilo, então as skinny jeans serão mais clássicas e que se usarão em várias estações. Mas quem adorar as boyfriend jeans e o seu estilo mais descontraído então opte por estas. Trends come and go with the seasons and sometimes it's complicated to invest in all trends. If you must choose only one style, then skinny jeans will be more classic and that will be used during various seasons. But those who love the boyfriend jeans and his more relaxed style then opt for these. - Não abusar dos acessórios. Apenas mala, óculos de sol e um lenço. - Don't abuse of the accessories. Only bag, sunglasses and a scarf. - Acessórios, tal como relógios e pulseiras e uma clutch (mais pequena ou maior). - Accessories, such as watches and bracelets and a clutch (smaller or larger). Os calções de cintura subida ficam sempre bem com uma blusa básica ou crop tops. Também se podem conjugar com blazers ou para um estilo mais rock com umas botas. The cutt off shorts are always good with a basic blouse or crop tops. You can also combine them with blazers or with rock style boots.